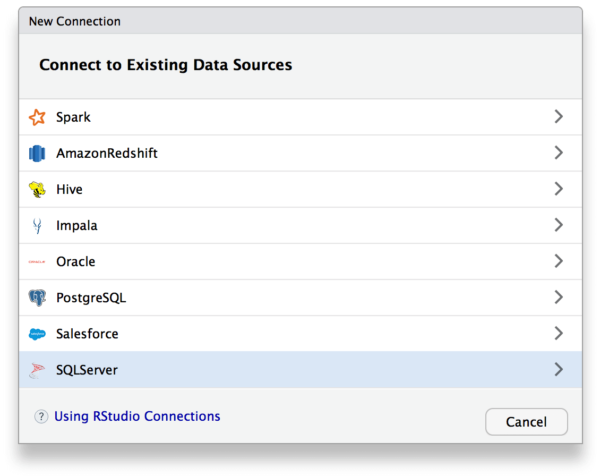 To RStudio commercial customers, we offer RStudio Professional ODBC Drivers, these are data connectors that help you connect to some of the most popular databases. This website is the main channel to provide support in this area. RStudio is also working through other delivery channels, such as upcoming webinars and in-person training during our RStudio conferences. An updated version of the Enterprise-ready Dashboards is now available. Here are the highlights: Includes dashboard design principles Introduces the r2d3 package for the visualizations Provides two new D3 visualizations that can be copied and easily integrated with other Shiny apps Better handling of the base query using dplyr and shiny::reactive() Adds an example for handling values for Shiny inputs using the set_names() function. Provides a new, and single, GitHub repo to download all of the cde and material from one location.